In the halls of anime history, there’s a duo well and truly ingrained as legendary partners: the Kirk and Spock of con artists, the Holmes and Watson of hallowed heist planners, two men so inextricably associated with one another that to mention one without the other is all but unthinkable. 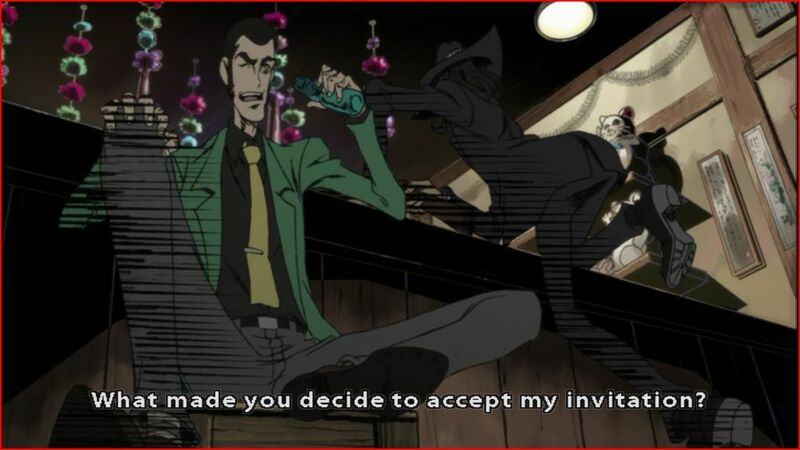 Ladies and gentlemen, I give you Arsené Lupin III and Daisuke Jigen. No fan would question the unbreakable bond between the two. Any argument after that is only a matter of degree, time and place. 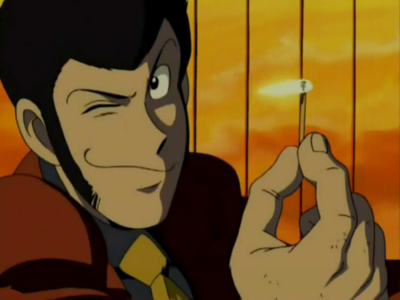 Explaining Lupin III (the character or the series) is not unlike trying to take apart a pomegranate: it’s a fairly simplistic whole on the outside, but split it open and suddenly there are a million little chambers that may or may not connect to one another. However, the following can generally be taken to be true: Arsené Lupin III is a gentleman thief, a title that he’s carried (along with his name) down the generations from his famous French grandfather. Lupin is a hyper-competent thief and master of disguise. He’s always thorough in researching his jobs, often preparing plenty of gadgets and a loyal crew to help carry off his elaborate heists. He values the thrill of theft more than the actual objects, and for that reason he delivers calling cards to his intended victims. More to that end he lives to amuse himself – a trait that, along with his nonchalance toward killing, changes its tone from series to series. It varies from the Bugs Bunny goofball of Red Jacket, to the Joker-esque capriciousness in The Woman Called Fujiko Mine, to the theatrical gentleman of The Castle of Cagliostro. 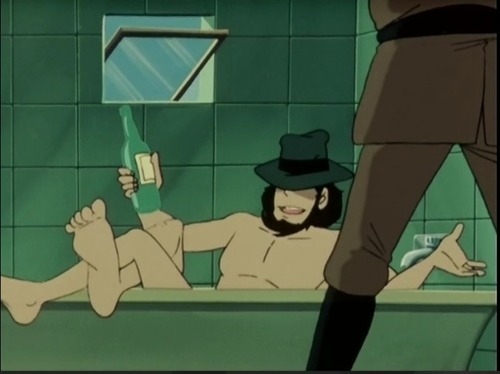 Despite his skills it’s proportionately rare to see him land a treasure for keeps, for he’s often brought low by his lust for women and his inflated ego (both of which are easily manipulated by his sometimes-lover Fujiko Mine, to Jigen’s constant irritation). 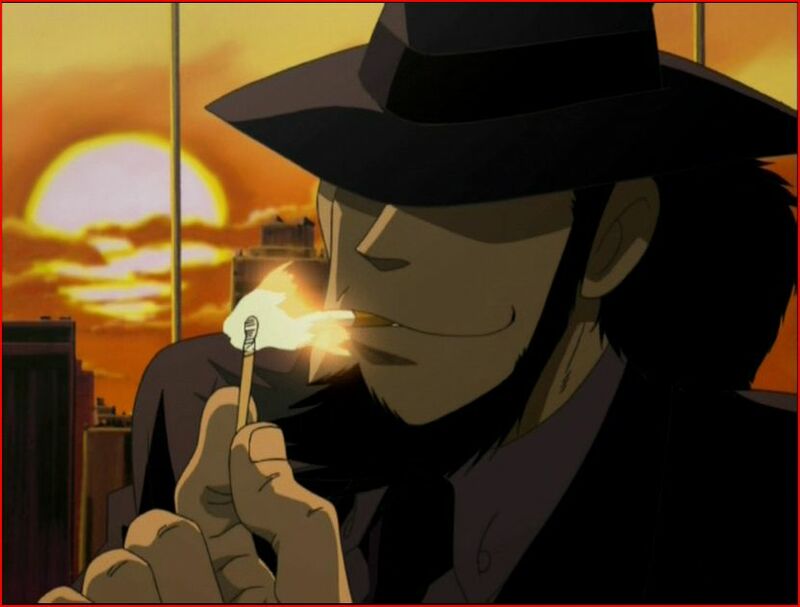 Daisuke Jigen (almost certainly a pseudonym, since his backstories fairly consistently portray him as starting out under the American mafia) is Lupin’s near-constant companion and most reliable partner. While his strongest talents are as an unbeatable gunman, he’s also a skilled driver of whatever vehicle a job requires, and takes on his share of disguises when necessary. He’s also the most likely member of the team to shut down Lupin’s ego, always happy to call him on a bad decision or a prideful blunder. It would seem his past led him to cross paths with most of the world’s elite assassins, as he can always be counted to recognize the latest deadly foe that comes knocking. Jigen is gruff and can generally be found relaxing (which has earned him the fan nickname “Lounge King”), with a sarcastic sense of humor and an easily riled temper. He’s deeply distrustful of women, which is no doubt helped by the fact that his love interests have a 99% likelihood of ending up traitorous or dead by the time credits roll (excluding the ones to whom he gets cast as a father-figure), and especially dislikes Fujiko. He’s also a chain smoker, only found without a cigarette when the danger at hand is truly serious. There’s no concrete timeline for how long Lupin and Jigen have worked together. One chapter of the manga cast them as childhood friends only to wave that idea aside, while the anime adaptations have offered several variations on how they came together. What is clear is that since then they’ve been inseparable. 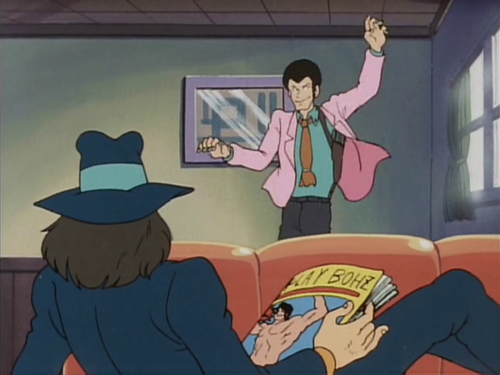 While the other members of Lupin’s gang come and go as their own goals dictate, Jigen is shown to travel and live with the thief pretty much full time. Actually, “not concrete, but…” pretty much describes the relationship in episodes not specifically devoted to their bond. 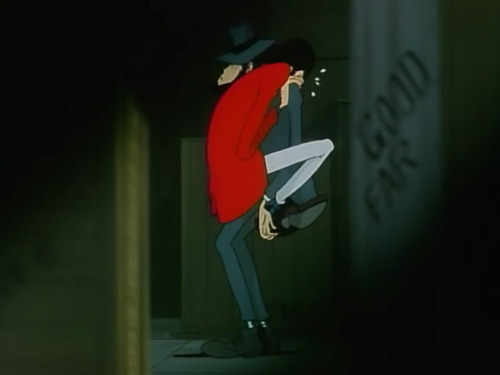 It’s all in the little things: the fact that Lupin often refers to his partner in crime as Jigen-chan, an endearment saved only for the gunman and Fujiko; the way the two can communicate elaborate plans with only a look or by speaking the other’s name; their extreme physical ease around each other, with the screenshot above hardly denting the wealth of examples (not to mention Lupin’s fairly common use of female disguises), and the pointedly seething anger Jigen displays whenever Lupin prioritizes Fujiko (a tension that fuels more than a few episodes). Now, all of the above is well enough in itself, creating an image of an easygoing but extremely deep relationship if that’s how you’re inclined to read their interactions. But taking just the aspects mentioned above, it’s equally possible to call the relationship theory an over-interpretation of a close friendship. And when I say possible, I mean ‘the kneejerk reaction of the overwhelmingly male fanbase over the years.’ And in a way, they’re right. Those factors alone don’t sell this ship as a romance. What we need is to take a look at the beginning, since observing the structure of how the two became partners will give us a prism through which to view the interactions above. 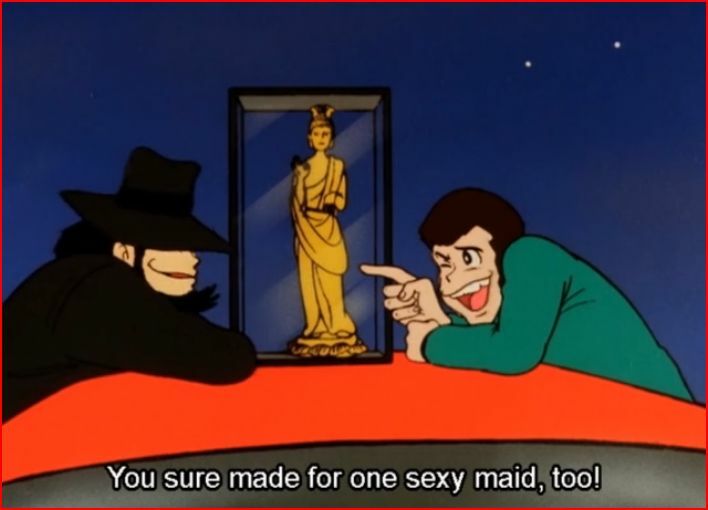 The story of First Contact is told (supposedly) by Jigen to an intrepid reporter, and begins thusly: Lupin, already a legend in the underworld, seduces his way into the mafia don’s private room (disguised quite convincingly as a woman), where half of an incredible treasure is stored. There he runs afoul of the don’s bodyguard, one Daisuke Jigen, and is forced to flee. Lupin’s informant Brad (a plot device if ever there was one) manages to nab the treasure following Lupin’s failure, only to be murdered for his troubled. From there the struggle between Lupin and the mob is on, each struggling to lay hands on both the treasure and the key that will open it. For the rest of the film there are two narrative threads. The A Plot involves the search for the treasure, which is how we meet Fujiko (Brad’s girlfriend), Zenigata (tasked with arresting Fujiko), and Goemon (who’s also looking for the key, in that it’s his future-trademark sword Zantetsuken). 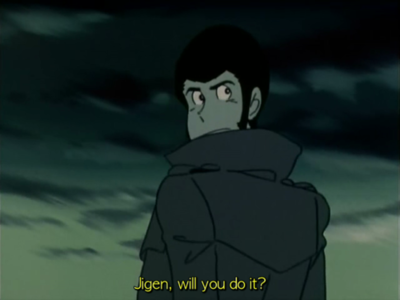 The B Plot involves Jigen’s attempt to make up for failing to kill Lupin, and Lupin in turn trying to coax the gunman into teaming up with him. This aspect, hidden at the heart of a killer noir thrill ride, plays the dramatic beats of a love story (since in this case we have two men, let us call the ‘hero’ role A and the ‘heroine’ role B): the story begins by introducing its two characters, an A who has something missing in their life (Lupin cannot complete his dream robbery without a reliable partner) and a B whose special qualities stand out from the pathetic circumstances they’re currently trapped in (Jigen is easily the best gunman in the mob, and has no respect for any of them); these two meet through dramatic circumstances, starting with antagonism on B’s part and fascination on A’s (the break in and shoot out); throughout the second act the two leads are repeatedly forced together by circumstances, allowing them to develop a bond, with A trying to catch B’s attention (Lupin’s “we’re the same” speech,); the turning point comes when A does something to prove himself worthy in B’s eyes, thus prompting the beginning of a change in B’s feelings (Lupin freeing Jigen, and rescuing him from the firing squad); and in the third act, B comes to A’s rescue, and the two cement their togetherness (Jigen defends Lupin against Goemon and brings back the getaway car, which is the above scene that begins their partnership). All of that brings us around to that final scene I showed off above. I have just enough restraint not to linger on the rather phallic imagery of the recurring cigarette lighting motif (which is, of all unexpected things, surprisingly similar to the m/m seduction subplot in Cabaret), but I do want to talk about Lupin’s dialogue. 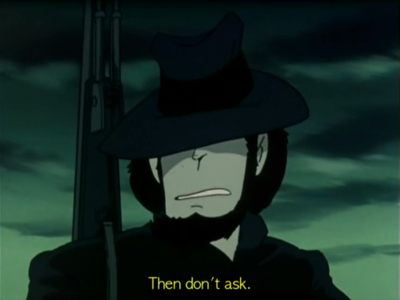 Jigen, you see, is never without his hat. Ever. The occasional rationalization is that it aids his marksmanship, but that’s so rarely brought up as to seem beside the point. This is a man to whom that one article of clothing is so defining that it’s all he needs to feel put together, even if it’s he’s totally starkers otherwise. By that same token, not having the hat is a major crisis (disguises notwithstanding, though even those tend to incorporate a hat of some kind). And given that First Contact is loaded with callbacks to franchise lore, it’s pretty safe to assume the writers knew that hat is The Hat – an object with capital letters and major character importance. In other words, whether you interpret it as solely an emotional vulnerability thing or rope in the physical as well, Lupin is essentially stating a desire to see his newfound partner naked. That’s the line that officially concludes the story-within-a-story, bringing the audience back to the present day of the frame narrative. Oh, and one more thing about romance stories? They tend to fade out on the happily ever after note – in other words, an image or concept that the audience is meant to read as the way that relationship will proceed for the foreseeable future. While the above film is pretty much the crown jewel as far as explicit focus on the ship is concerned, we’re not quite done yet. I did say that introductions were the best way to get grounding as far as where the characters were coming from, and the franchise now has two sets of prequels. Our second object of focus is 2012’s The Woman Called Fujiko Mine, a breathtaking little TV series (not to mention the first Lupin work by a female director). 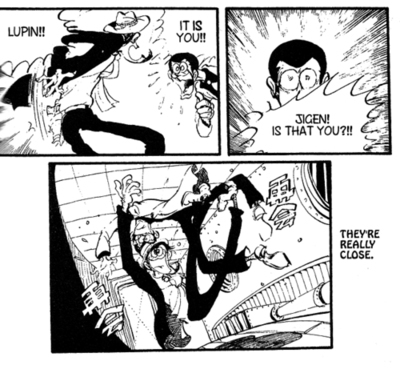 As the title might’ve indicated Lupin and Jigen are closer to being secondary characters in this series, but that’s not as much of a deterrent to our analysis as you might think. Y’see, Fujiko Mine is a story that’s quite interested in parallel stories and ‘what if’ scenarios, which results in a plethora of foils:, Oscar and Fujiko’s rivalry (a microcosm of Zeniagata and Lupin’s) as well as the cast’s disparate reactions to their similarly motivated breakdowns; the various victims of the memory experiments and, for this essay’s purposes, the relationship of Fujiko and Goemon as it relates to Jigen and Lupin. because the burgeoning romantic interludes that the prequel series spun from that are unbelievably heartwarming. And the importance of that comes back around to the same question of structure as before, in keeping with those reflexive undercurrents in the narrative. For the overt romance subplot is once again in keeping with the pattern of interactions between our two thieves. One of the series’ many glorious “spot the homage” moments: the first is from the second episode of Green Jacket, wherein Lupin has just rescued Fujiko and is making her dinner in an attempt to woo her. 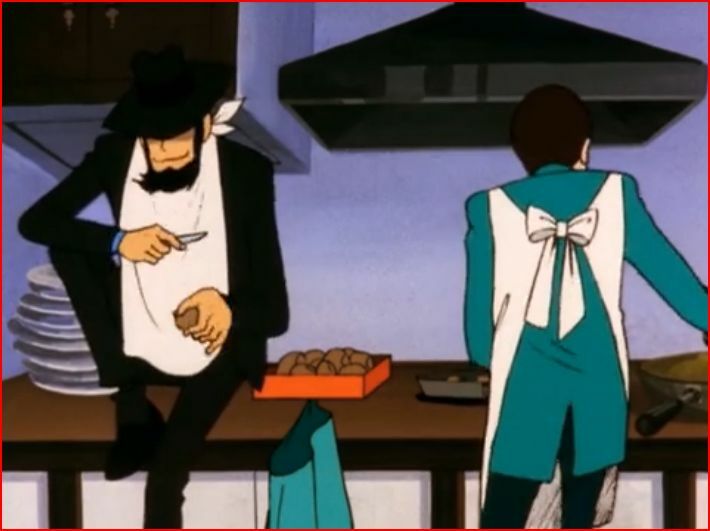 The second is episode eight of Fujiko Mine…wherein Lupin has just rescued Jigen, and is making him dinner before wooing him helping with a job. The pattern of Fujiko and Goemon’s relationship goes as follows: there is an episode where they meet and have opposing desires, but eventually are required to work together to survive. The second time they meet Goemon saves Fujiko from being captured, and then serves as backup in the goal she is attempting to carry out. After Fujiko’s mental state begins to break down, he takes her in when she has nowhere else to go, and attempts to care for her. And at their last meeting of the series, he declares her his girlfriend. 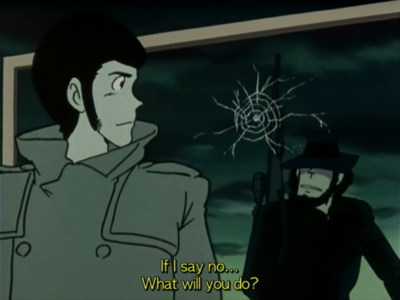 As you’ve probably already guessed from my extremely leading descriptions, Jigen and Lupin follow the same pattern: they fight over a hidden treasure in a pyramid, but must cooperate to escape the death traps; Lupin rescues Jigen after he’s arrested, and ropes him into helping with a job; since Jigen is homeless, he accepts Lupin’s invitation to help with another job (that comes with a hot springs vacation); and their final interaction of the series is yet another homage – to First Contact, if you’d believe it! 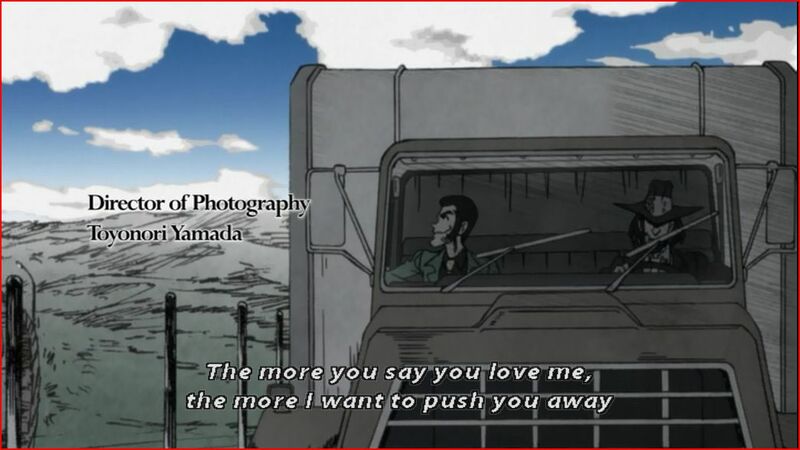 Lupin’s walking on the side of the road after a job, and Jigen comes to pick him up in the same type of truck Lupin used to rescue him earlier. In other words, over the course of a decade we progressed from ‘here is the popular structure of romantically inclined films, to which these characters’ relationship has a number of similarities’ to ‘here is an overtly romantic relationship as defined by the universe of the series, and here are two more characters that follow the same pattern as that romance.’ It’s brought up far less often than First Contact given its comparative subtlety, but I still count it as a major moment for the relationship’s legitimacy. I’ve expended a lot of energy laying out the plausibility of this relationship, but there’s one big thing that still needs to be addressed: birds fly, fish swim, Bioware games have good writing, and Arsené Lupin III love Fujiko Mine. It’s not just a canonical relationship, it’s part of the beating heart of the franchise. Trying to discount it would go way beyond blind and sail into the land of failing to understand the characters. But while the Lupin/Fujiko relationship might be constant, it’s anything but common. Neither of them, to start with, is exactly the settling down kind. The best portrayals of their romance feature a marriage of equals, two friendly rivals who crash into each other with the exhilaration of knowing just how few can play at their level. And when they part, it’s no big deal. They’ll meet again, after all. Loving Fujiko didn’t stop Lupin from pursuing any of the Girls of the Week, nor did it keep Fujiko from dating Goemon and seducing various clueless berks for their treasure. 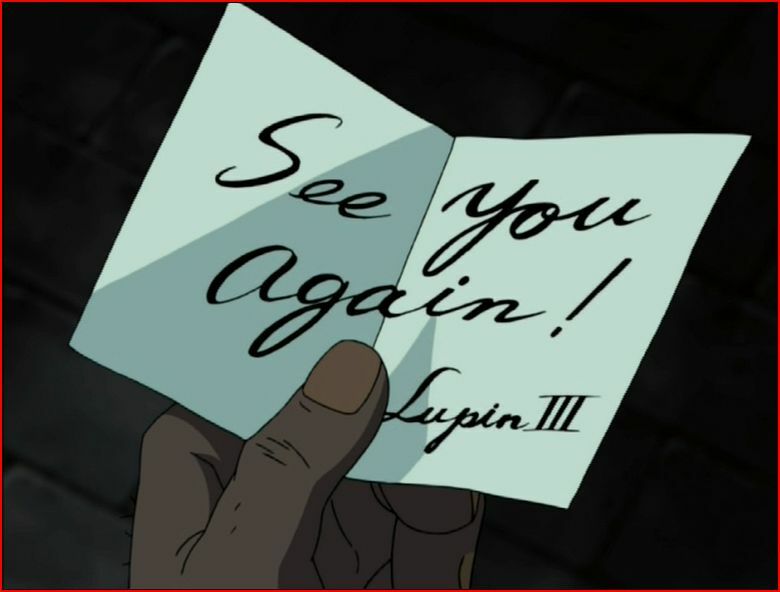 Nor does her complete disinterest in Lupin during Farewell to Nostradamus discount their long history together. Why should the possibility of Lupin/Jigen be automatically discounted? Here we tread into the dangerous territory of the theoretical, for there’s nothing overtly in the canon to bolster my theory besides conjecture. However, having followed me to this point, I’d hope you’d come a few steps further: Lupin is a character who represents, at heart, an escapist desire on the part of the audience. He’s a womanizer and a thief, a gentleman and a con. Part of the joy of watching him is the way he flouts the conventions of society, while still being (with varying degrees of moral grey) a decent person (at least to his adopted family). With that in mind, I absolutely believe he’d be involved in an open/poly relationship. He’s a guy who’s made his motto on always getting what he sets his mind to, after all. 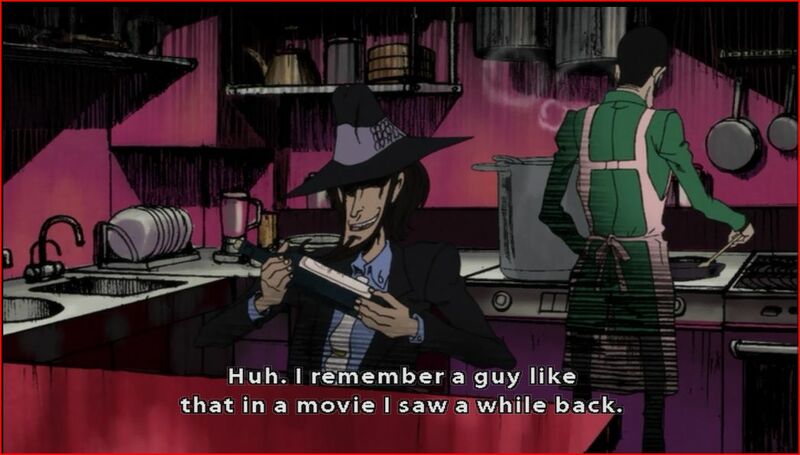 And it certainly adds a layer of ‘ah, of course’ to the snippiness of Jigen and Fujiko’s interactions. Or, if you’d rather, it could be possible that the boundaries and definitions of Lupin’s relationships are as ever-changing as the man himself, marked by the consistency of the people in it rather than what they are to each other in the given moment – be it friends, partners, rivals, or lovers. My goal in writing this essay was mainly to prove the validity of one aspect of a multi-faceted and enduring relationship. At a certain point, these are characters who’ve been part of each other for so long, who are so beyond obviously important to one another, that there’s really nothing that needs to be said. Well, I really didn’t see that before until I read this. Based from the images you’ve given, I think they’re one kiss short of romance.. I guess best friends are really like old married couples. I find this article interesting, pointing out the complexities of their relationships that looks deceivingly simple, I overlook it until you mentioned it. One kiss short…I like it. In a way, they remind me of cases like Soul and Maka (from Soul Eater), or Mulder and Scully, or Kirk and Spock. The chemistry is there in spades, it’s just not the primary focus of the narrative, and so people wind up overlooking it. And if I convinced you, all the better (or I’m glad you enjoyed it, anyway). 😉 I’ve more than a bit of a soft spot for the two of them, and I watched those complexities get brushed off for so long by viewers that I felt a bit of a need to sell the case. 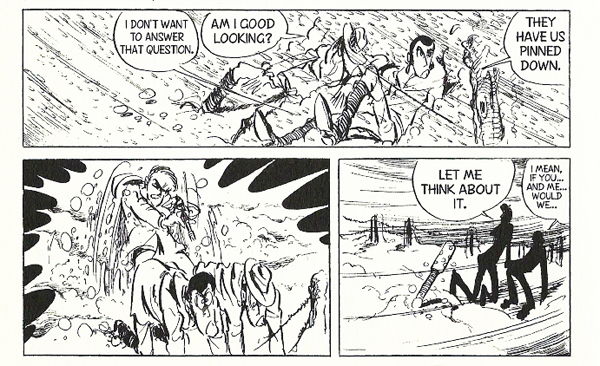 I’ve always been edging on the side of romance between Lupin and Jigen (especially in Secret of Mamo and First Contact), so it was really nice to see it all laid out in an analytical way. I especially liked how obviously jealous Jigen was of Fujiko in Secret of Mamo to the point where he walks out on Lupin, only he’s unable to stay away and by the end, rescues Lupin from the exploding island. There’s definitely quite a bit to work with over the course of the franchise – Mamo is a huge one and I didn’t touch on it at all! But more than anything I love how arguing a romance between them doesn’t necessitate tearing down his love for Fujiko or hers for him. Everybody wins. I really loved this essay and as soon as you mentioned an open/poly relationship it totally cemented it as a golden one. I’m pretty new to the Lupin franchise, my only experience with it being The Woman Called Fujiko Mine, which I checked out after having read the intro to your analysis to it. It’s so often that the possibility of poly relationships get over looked or outright ignored in most critical essays, and it’s a breath of fresh air to not only see you mention it but portray it in a positive light! I can’t wait to start watching more Lupin now and I’ll be keeping this essay in mind as I do! I mean, poly is what makes the most sense, right? 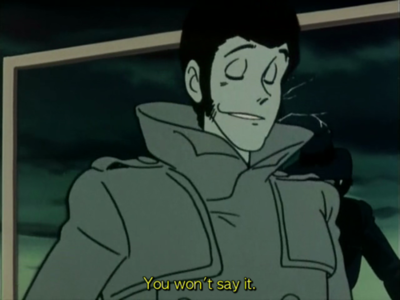 Even in his overt flirtations with Fujiko, Lupin never really backs down on being a flirt. Trying to crowbar monogamy into their thief family situation is a recipe only for anguish. And I quite agree – there absolutely need to be more examples out there of happy, healthy poly relationships (and I’d be particularly happy to see more queer and fidelitous poly relationships, since a lot of the discourse that IS available seems to focus more on open structures and mostly hetero relationships). I just want to give you a big thank you for this essay and everything else you’ve written about Lupin. I read all of your posts about the series in one go because you have such a perfect understanding of the characters and analyse things in a way that’s interesting, deep and funny. This post in particular is my favourite because for a long time, I shipped Lupin/Jigen as a sad and resigned one-sided love on Jigen’s part, but your thoughts on the open/poly angle make so much sense that suddenly I feel like I’m seeing everything in new light. My thanks to you! I tell you what, I’ve ended up in a place where non-poly Lupin just doesn’t make a lick of sense to me. Mr. international thief extraordinaire, flaunter of laws and lover of freedom, married to heteronormative culture? Naaaaaaaaah. I LOVE THIS DESCRIPTION OF FUJIKO AND LUPIN’S RELATIONSHIP AHHHH. 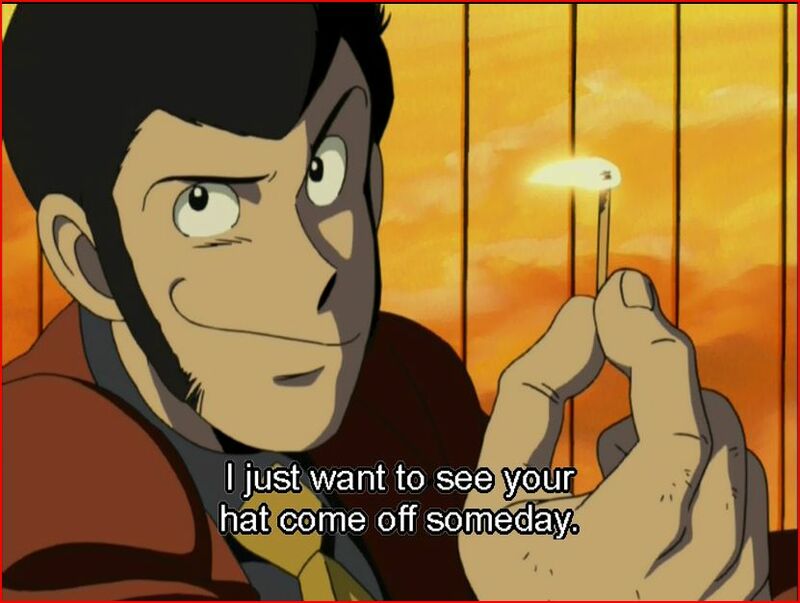 But seriously, it was your blog that convinced me of Lupin/Jigen being a totally plausible thing. THE LUPIN FAMILY, IT IS SO GRAND. I’ve been hearing a few folks today saying I managed to convert them to this ship/poly-Lupin. It makes me proud waaaaaaay down to the bottom of my nerd bones. With the exception of Jigen and Fujiko, pretty much everyone seems to be involved with everyone to some degree in this franchise lol. 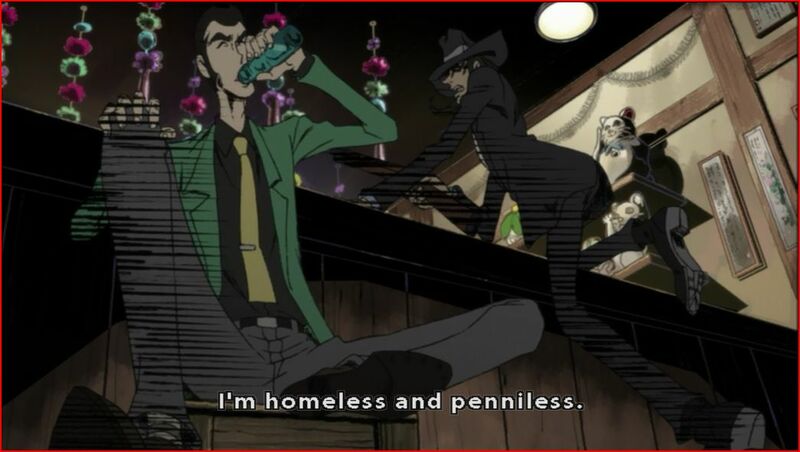 And by Jigen and Fujiko as exceptions, I just meant with one another.